These days, more and more homeowners prefer organic weed control in lawns. You might see the do-it-yourself types of people pouring boiling water or vinegar on their weeds. Others are out there every weekend, yanking dandelions and crabgrass by hand. It’s backbreaking work, and the truth is that the satisfaction these methods produce is fleeting. One problem with these weed control methods is that they do nothing to prevent weed seeds from spreading and sprouting. These weed removal methods can also leave pieces of the roots alive in the ground, and it’s just a matter of time before they regenerate another weed above the soil’s surface. The idea of organic weed control is compelling. It’s understandable that people might worry about the safety of chemical-based products. We know you want your weeds gone, but also you want to feel that your kids and pets are safe playing on your lawn. Keep reading to learn more about your best bets when it comes to organic weed control in lawns. How can organic fertilizers kill weeds? Well, they don’t directly eradicate weeds, but they can promote turf health. The thicker and healthier your grass shoots are, the better job they will do of squeezing out the weeds. Healthy grass makes good use of sunlight, water, and nutrients in the soil. When your grass is using up these resources, less is available to weed plants. Eventually, the intruders will die out. Thick grass also shades the soil below. This can be all it takes to prevent many weed seeds from germinating. Spreading organic fertilizer based on manure or worm castings can do a great job of boosting turf health and slowing the growth of weeds. There are products on the market that allow homeowners to kill their weeds with the power of steam. They work much like the steam machines you might use to take the wrinkles out of your delicate clothing. It looks a bit like an old vacuum, but the tank holds tap water that’s super-heated to 300 degrees Fahrenheit. You simply point the rigid hose down at your weeds and pull the trigger. While steaming away your weeds might seem easier than pulling them, it’s important to note that the steam will damage or kill all of the foliage it contacts. Plus, some weeds will require more than one steaming before they are killed. And, you will need to come up with a feasible way to lug the water tank around your yard – it does not come with a wheeled cart or backpack apparatus. A handful of stray weeds here and there are nothing to fret about. No matter how healthy your grass is, we all experience a few weeds from time to time. If you’re only seeing a small number of isolated weeds, it’s reasonable to pull them by hand. There are even tools on the market that make it easy to pull weeds from the root without even bending over. Crabgrass and clover are two kinds of weeds that spread rapidly. When your weeds become widespread and unmanageable, it’s time to look at sprayable or spreadable solutions. Organic weed control options tend to be concentrates based on acetic acid (vinegar), citric acid, and other fairly benign ingredients. Because these products are concentrated, it’s still best to have a lawn care professional apply them to your lawn. You can still damage your grass if you use these organic products incorrectly. In addition, there are organic herbicides on the market that wipe out all foliage they are sprayed on – including all grasses. If you insist on buying and applying your weed control products yourself, read labels closely to make sure you buy the correct type of weed control product. 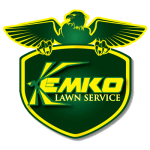 Kemko Lawn & Shrub is a trusted source of information for Atlanta’s organic weed control needs. With more than 30 years of experience bringing Atlanta’s lawns to life, we know what it will take to get you the thick, green lawn you really want. Our team is eager to answer your questions about organic lawn care and anything else you want to know about weed control. Kemko offers a complimentary, no-obligation estimate to all of our new clients. We make it easy for you to gather information and comparison shop for a trustworthy lawn care expert. All you have to do is complete our online form, and one of our teammates will get back to you as fast as possible. Ready to learn more about organic weed control in lawns? Contact Kemko today.